"This is my version of a Chinese classic, Cold Ginger Chicken. I like to serve this with steamed jasmine rice and Japanese-style marinated cucumbers. It makes for a pretty presentation when sliced on bias and served with the bright green, fresh sauce drizzled all over it." Pour the white wine into a saucepan of lightly salted water, and place the chicken breasts into the pan. Bring the pan to a boil, reduce the heat, and simmer the chicken until cooked through and white, 8 to 10 minutes. Remove from the heat, and let the chicken cool in the broth. Remove from the broth, and set the chicken aside. Heat the vegetable oil in a skillet over medium-low heat, and stir in the ginger, garlic, salt, and sugar. Reduce heat to low, and cook, stirring occasionally, until the garlic is browned and soft, and the oil is flavored, about 20 minutes. Stir in the green onions, and cook for another 10 minutes, stirring occasionally, until the white parts of the onions are soft. Slice the poached chicken breasts on the bias into slices about 1 inch wide, and arrange attractively on a plate. 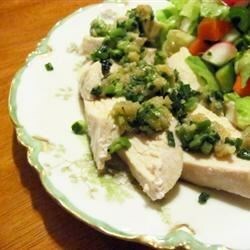 Spoon the green onion mixture over the chicken breasts, and serve. Tender chicken served with penne pasta in a creamy spinach and pesto sauce. EXCELLENT! I prepared it just as stated and it was not only tasty, but beautiful as well. I will next serve this for some company I'm expecting this weekend. Thanks!